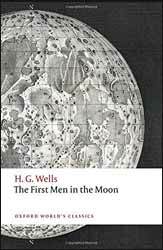 H. G. Wells had an extraordinary period of creative brilliance, between 1895 and 1901, he had, among others, published The Island of Doctor Moreau (1896), The Invisible Man (1897), The War of the Worlds (1898) and The First Men in the Moon (1901). The First Men on the Moon (1901. New imprint 2017. 181 pages) is a science fiction novella detailing man’s first successful attempt to land on the moon. The book opens with the narrator of the story, Mr Bedford, having been unsuccessful in business and being currently chased by his creditors, retiring to the quiet countryside to write a play which he hopes will reverse his fortunes. Fortuitously, the nearby cottage belongs to an eccentric inventor, Mr Cavor, who is in the process of perfecting a method of creating a substance which is transparent to gravity in the way glass is to light. With no gravity to hold him back Cavor intends to journey to the moon. Bedford's draw to Cavor’s discovery has little to do with an interest in invention or innovation; rather he is covetous of the material seeing a way to reverse his fortunes. Being men of their time and products of their social milieu both men seem a little odd to a modern reader. Where Bedford is just capitalistically greedy seeing a chance to wrest any available wealth from the moon, Cavor is focused to the point of callousness and dismisses the potential death of his laboratory assistance as merely an inconvenience, as if working class people had no intrinsic value. When the couple eventually do reach the moon they discover that it is not so lifeless, we shall skip across the more outlandish notions like the mooncalf’s and the existence of a thin but breathable atmosphere. Such elements have always cropped up in science fiction before the advancement of astronomy proved them to be wrong. It is best to suspend belief and just go with it otherwise you would also consign to the bin of history nearly all of Edgar Rice Burroughs's work. The society they find, the Selenite’s, named for the moon goddess, Selene, have a highly stratified, ordered society, not unlike an ideal version of communism. It is somewhat unclear what Wells was trying to say. In life he was often accused of being a technocrat, this ideal is most famously used in The Shape of Things to Come (1933) which successfully predicted the idea of the total war which would break out in 1939. In the book mankind is saved when the technocrats finally take power. We can read it as a form of satirical condemnation for the class inequalities in Victorian society, an idea which had been touched on in his first novel, The Time Machine (1895). Like the other books in the Oxford University Press collection there has been much love and care devoted to this new imprint. Like the other novellas, it is annotated in places where either language has change to make the original meaning obscure or where Wells has referenced something his contemporary reader would be aware of which remain a mystery to a modern reader. There is an extensive and highly knowledgeable introduction to the story, as well as a selected Bibliography and a Chronology of H. G. Wells's life. This is a nice paperback version of the story will lots of supplementary information, well worth picking up if you don’t already have it.